in 2013 ) w/ Fadal CNC88HS Controls, 21-Station ATC, CAT-40 Taper Spindle, 10,000 RPM, Rigid Tapping, 20” x 48”Table, Coolant. 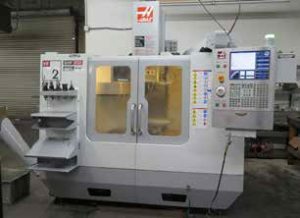 2008 Haas VF-2D CNC Vertical Machining Center s/n 1066994 w/ Haas Controls, 20-Sttion ATC, CAT-40Taper Spindle, 7500 RPM, 20Hp Vector Dual Drive, 16mg Expanded Memory, Rigid Tapping, Quick Code, 34-Position Coolant Spigot, USB Port, Chip Auger, 14” x 36” Table, Coolant, Front and Rear StorageRacks. 1995 Fadal VMC4020HT mdl. 906 CNC Vertical Machining Center s/n 9511313 w/ Fadal CNC88HSControls, 21-Station ATC, CAT-40 Taper Spindle, 7500 RPM, High Speed CPU, Rigid Tapping, Graphics, 4 th -Axis Prewire, 20” x 48” Table, Coolant. 1995 HwaCheon Hi-ECO31A CNC Turning Center s/n M05734311L-49 w/ Fanuc Series 0-T Controls, 10-Station Turret, Hydraulic Tailstock, 10” 3-Jaw Power Chuck, Coolant. DoAll C-916A 9” Automatic Horizontal Band Saw s/n 49192255 w/ DoAll Controls, Auto Feeds, Coolant,Conveyor (NEEDS PNEUMATIC CYLINDER REPAIR). Webb Vertical Mill w/ Sony Millman DRO, 3Hp Motor, 60-4200 Dial Change RPM, Chrome Ways, PowerFeed, 9” x 42” Table. Kent KGS-250AHD 8” x 20” Automatic Hydraulic Surface Grinder s/n 85010302 w/ Kent Controls, Automatic Cycles, Kanetsu 8” x 20” Magnetic Chuck. Cuttermaster mdl. FCG-30 Tool and Cutter Grinder s/n 0711 w/ 5C Air Fixture. mdl. R Control Box, Renishaw TP-ES Probe Head, 22” x 29.5” x 19” Work Envelope, 22” x 29” x 3” Granite Plate. Microflat 36” x 72” x 8” 2-Ledge Grade “A” Granite Surface Plate w/ Stand. Yale Electric Forklift w/ 3-Stage Short Mast, Solid Tires, Charger (NEEDS BATTERY). 10Hp Horizontal Air Compressor w/ 3-Stage Pump, 120 Gallon Tank. 5Hp Horizontal Air Compressor w/ 2-Stage Pump, 60 Gallon Tank.